Washington, DC, March 17, 2009: The American National Standards Institute (ANSI), coordinator of the U.S. standards and conformity assessment system, today named three Accredited Elevator and Escalator Certification Organizations (AECO) that were part of the pilot program launched by ANSI in February 2008. The following Certification Bodies are the first to be recognized under the AECO program, which operates according to requirements defined in the international standard ISO/IEC Guide 65, General Requirements for Bodies Operating Product Certification Systems, and in ASME A17.7/CSA B44.7, Performance-based safety code for elevators and escalators. 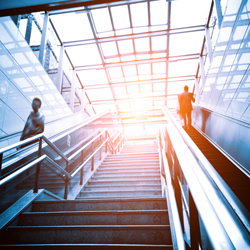 With hundreds of thousands of elevators and escalators transporting citizens in North America each day, manufacturers are eager to demonstrate the safety and reliability of their products. Through this program, AECOs are accredited by ANSI to evaluate and certify elevator and escalator systems, subsystems, components, and functions. These products are evaluated against the guidelines of ASME A17.7/CSA B44.7, a standard that was developed jointly by ASME and the CSA. Those that meet these guidelines can be certified. Third-party accreditation by ANSI enhances the credibility and value of the process by attesting to the competence and qualification of Certification Bodies to act as certifiers, offering them a significant distinction from their competitors in the marketplace. ANSI values the importance of accreditation in enhancing consumer safety and international trade. The Institute’s portfolio of accreditation services includes programs for a wide variety of product certification bodies, such as AECOs, personnel certification bodies, greenhouse gas validation and verification bodies, and standards developers. In 2007, ANSI signed a Multilateral Recognition Agreement (MLA) with the International Accreditation Forum (IAF), bringing worldwide recognition and acceptance to the Institute’s accreditation program for product certification bodies. The Institute is the official U.S. representative to the International Organization for Standardization (ISO) and, via the U.S. National Committee , the International Electrotechnical Commission (IEC), and is a U.S. representative to the International Accreditation Forum (IAF).